Most of the plate varieties shown below are listed by Zirkle. Zirkle makes the point that the plates for producing the overprints were designed especially for each value. She speculates that due to wear, it is though that the plate made for the 4f became unusable and the print run was finished by substituting the plate made for the 2f. 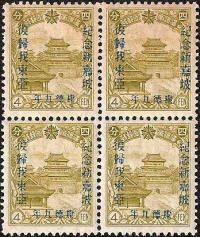 Instances have occurred where the 2f varieties have appeared on the 4f stamp, which seems to support this theory. Thanks to Travis Searls who supplied the excellent scans of full sheets, as shown below. a. Short Horizontal Line Variety - This appears on the character second down on the left, of the five horizontal lines the second is shortened. 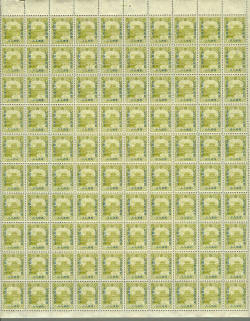 This occurs only on the 7th and 53rd stamp on each sheet. a. Open Top Character Variety - The bottom left character is open at the top. 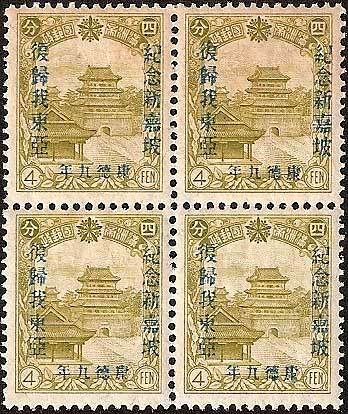 This occurs only on the 10th stamp on each sheet. b. Red Spots Variety - The second and third characters on the left are surrounded by a noticeable scatter of red spots. 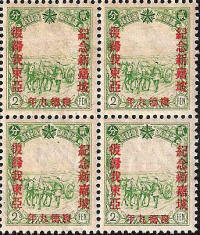 This occurs only on the 10th stamp on each sheet. b. Broken Top Horizontal Variety - The top horizontal line of this character is missing, as is part of the down-stroke. This occurs only on the 20th stamp on each sheet. c. Broken Horizontal Line Variety - Again this appears on the character second down on the left, of the five horizontal lines the third is broken. This occurs only on the 34th stamp on each sheet. c. Right Hand Vertical Missing Variety - The vertical line that should appear to close the right hade side of the box formed by this character is missing. 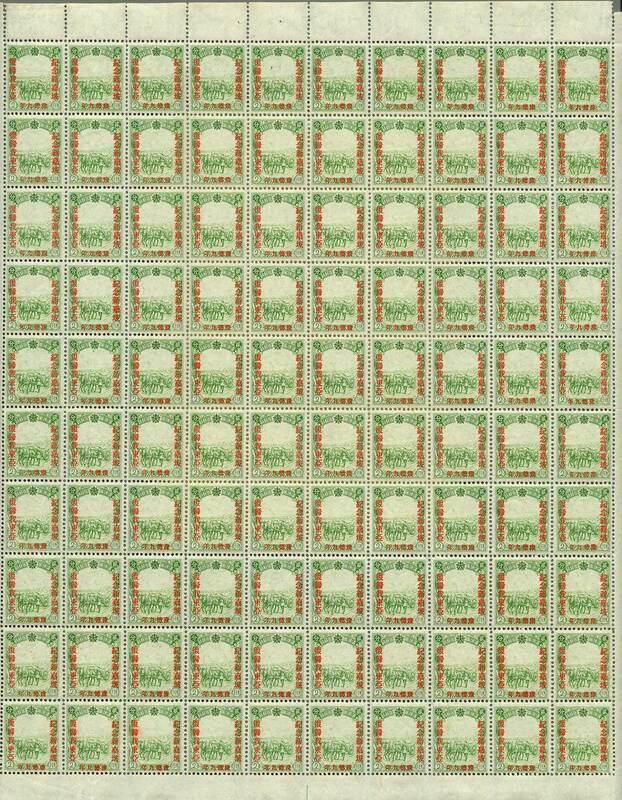 This occurs only on the 25th stamp on each sheet. d. Short Top Horizontal Variety - The top line of the third horizontal character from the left is shorter. This occurs only on the 54th stamp on each sheet. d. Strokes Missing Variety - Upper parts of the second horizontal character are missing. 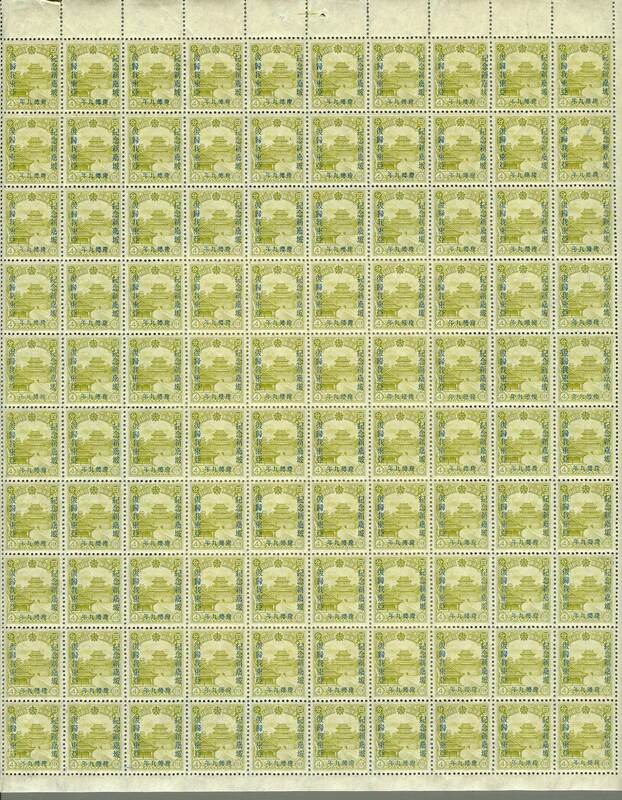 This occurs only on the 41st stamp on each sheet. e. Blob on Top Variety - The top of the second character of the horizontal row has a blob at the top of the vertical stroke. This occurs only on the 57th stamp on each sheet. e. Missing Top Line Variety - The horizontal line that should complete the to left hand character is missing. This occurs on the 28th, 30th and 34th stamp on each sheet. f. Long Stroke Variety - The central horizontal stroke of the top right character is elongated. This occurs only on the 80th stamp on each sheet. f. Feint Top Line Variety - The top horizontal line of the top right hand character is feint or broken. 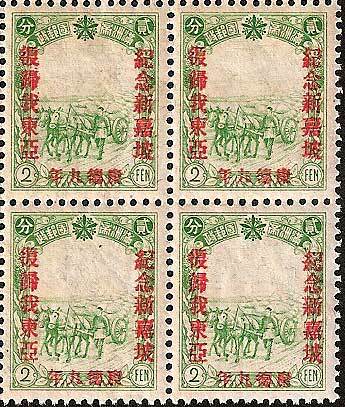 This occurs only on the 32nd stamp on each sheet (also see type g. below). g. Broken Top Stroke Variety - In this instance part of the top horizontal stroke is missing on character shown and the first right hand character is the same as type (f.) above. This occurs only on the 33rd stamp on each sheet. h. Horizontal Top Line Missing Variety - The top horizontal line is missing in the first character in the bottom row. 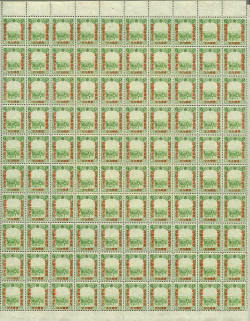 This occurs only on the 61st stamp on each sheet.